After two wins in a week Crawley Town fans came down with a mighty bump witnessing a Boxing Day performance against Colchester United as leaden as a stale Christmas pudding. Then Reds delighted those supporters as they ground out a passionate win against Stevenage despite playing for nearly an hour with only ten men. Whatever possessed Harry Kewell to meddle with the set-up that won heroically at Accrington Stanley I can’t imagine but significantly in little more than an hour each of the replacements had been hooked. Thomas Verheydt played as a target man – a role to which he seems quite unsuited given his lack of agility, pace and strength when challenged. Kaby Djalo and Moussa Sanoh did not provide adequate cover for either Jimmy Smith’s tenacity; Dannie Bulman’s reading of the game or Josh Payne’s vision. One frustrated voice in the West Stand complained “I’ve come to watch the first team” so it was ironic that our downfall was due to the inadequacies of the regular back line. Four players were found wanting in the build up to Mikael Mandron’s fourth minute opener while the in-form Sammie Szmodics welcomed the acres of space he was allowed for Colchester’s second. No change there. Late replacement keeper Yusuf Mersin was not at fault for the goals but tellingly when offered chances to make a name for himself he failed to take them. We missed Joe McNerney’s calmness in defence that could have allowed Josh Yorwerth to bring some enthusiasm to the back of the midfield diamond. On Saturday the line-up had a more substantial feel to it and Crawley took on Stevenage in bold and enterprising fashion with the returning Enzio Boldewijn soon coming up with a candidate for goal of the season. The flank man received the ball deep in his own half and held off all challenges as he dribbled down the left. Unluckily when he got clear inside the opposition penalty area he failed to shoot cleanly and Joe Fryer collected the ball. Minutes later Boldewijn got his reward as Fryer could not hang onto a well struck 25-yarder by Mark Randall and the Dutchman netted his third goal in two games. Two minutes later everything changed as Josh Payne was sent-off following a strong tackle, despite playing the ball cleanly, and Stevenage took up the cudgels. 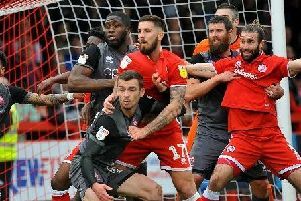 Crawley’s defensive play was superb all along the back line and possibly they could have relieved some of the pressure by adopting a bolder approach but they held out for a brilliant win that eventually released the supporters from the trauma induced by watching the struggle. The standard of football was no better than average and the entertainment value close to zero but all was forgiven by more than 1800 home supporters who loved the way their team simply refused to be beaten.